When we’re not looking with our eyes. 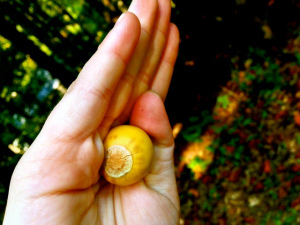 We have noticed that acorns are falling out of the trees like crazy lately. Many times, the girls and I have barely missed being clonked on the head by a falling acorn. On this particular day, all three of us just missed being hit. It’s just nuts, I tell you! Literally.